Land mines are notorious for leaving a legacy of ongoing destruction from Southeast Asia to Africa, taking the lives and limbs of civilians decades after the wars and hostilities that brought them in the first place. As detonation is one of the main strategies for removal, clearing mines can be expensive and dangerous for people. It may also be harmful to the environment, according to recent research conducted in northern Iraq which is the first to indicate that mine clearing operations can leave high levels of heavy metals in the soil, potentially causing problems for ecosystems and humans in the area. The Iran-Iraq War ended in a ceasefire in August 1988, but thousands of landmines remain in areas near the border. The Mines Advisory Group, a British organization focused on removing and destroying mines, began to clear the explosives in 1991 in areas of Kurdistan, either by detonating them where found or by taking mines collected from around the countryside and exploding them in a central location. Previous research by Rahel Hamad, a professor at the petroleum geosciences department at Soran University in Iraq, used satellite images to show that the explosions from demining operations have fragmented some forested areas in the Halgurd-Sakran National Park near Soran in northern Iraq, potentially contributing to a drop in biodiversity in the area. In their latest study, Hamad and his coauthors wanted to see whether the soil itself was affected by these operations. In 2016, they found areas used to explode mines in the national park with the help of the organizations that cleared them. “You can see the change in color around the explosion, especially the soils–they become darker because of the heavy metals,” Hamad told Earther. The researchers collected nine samples each from a roughly 20 square-meter area around two explosion sites and sent them to a laboratory in Canada to determine the level of heavy metals present in the soil, comparing the results to global standard soil measurements. They discovered extremely high levels of nickel and chromium, with the highest sample of nickel showing more than six times the global standard, as well as above average levels of manganese, arsenic and copper. They also discovered high levels of cobalt. All of these elements are generated from the detonation of mines. The study was small-scale and exploratory, but offers some of the first concrete evidence that even the controlled detonation of mines can create lingering problems. Hamad and his coauthors note that research on the soil between France and Belgium, which saw heavy use of mines and other sources of toxins during World War I, shows ground is still polluted even a century later. They said that over time, the whole area around the mines in Kurdistan could contain these pollutants. Lead study author Rahel Hamad (left) and mining detonation specialist Dilshad Chomany (right). This could have a negative impact on the flora growing in the soil, and any fauna eating these plants. Elevated levels of heavy metals could also potentially affect humans who use cleared areas cleared of mines to grow crops or graze sheep. “The largest significance of the study is to help the decision makers conserve the national park,” Hamad said, adding that they could produce risk maps for areas contaminated during mine clearing operations. Hamad said that the next step in this work is to check for soil contamination around more detonation areas and to study the concentration of heavy metals in other parts of the national park. Ryan Casey, the chair of the chemistry department at Towson University in Maryland who studies soil contamination but who was not involved in the new research, said the authors “did a good job indicating that there is evidence of soil contamination from some of the metals they studied.” He added that if the same levels of nickel and manganese discovered in Hamad’s study were found in Maryland soil, a cleanup would likely be recommended. But he says future research on this area should try to quantify the baseline levels of heavy metals in these soils in order to determine how the exploded mines have affected things, rather than measuring them against a global standard. 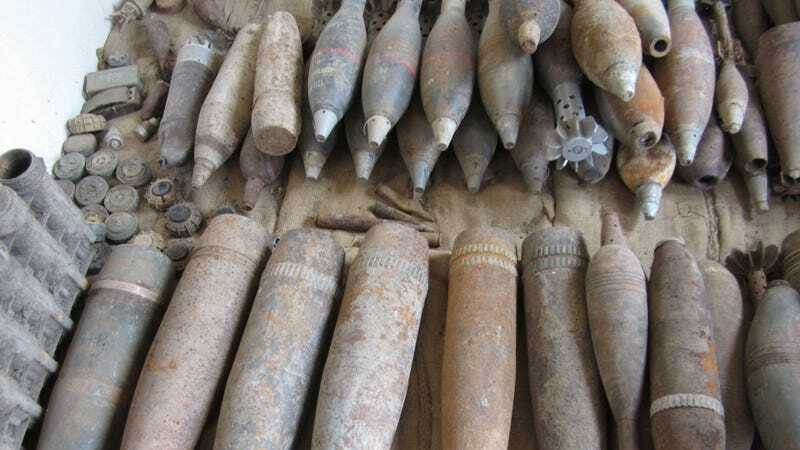 Hamad said that he didn’t take these samples because he doesn’t trust the area to show normal levels due to eight years of fighting in the area during the war, when mines and other bombs exploded all over the place. But, the concentrations of heavy metals are higher in their small sample areas right around the actual explosion sites as opposed to on the outside of the square study areas. Hamad emphasized that the biggest problem posed by mines is the immediate danger to life and limb. While in many of the villages in the area, he witnessed a number of children and adults missing legs or arms. He even witnessed kids chasing balls into mine fields with clear signs warning them away. Heiko Balzter, Director of the Centre for Landscape and Climate Research at the University of Leicester in England and a coauthor on Hamad’s study, said in an email that clearing the mines is sometimes the only option. “Ideally one would collect unexploded land mines without detonating them, but this is sometimes not practical,” he said. Casey said areas where mines had exploded could remain contaminated for a long time, though just how long depends on the soil properties and local weather conditions. “The default assumption is that this is a long-term issue. These metals will be around at least on the order of decades,” Casey said. According to Balzter, the best way to avoid all these problems is to stop the use of mines in the first place. “A ban on the production, sales and use of land mines is my highest priority recommendation to avoid building up an even bigger future legacy,” he said.